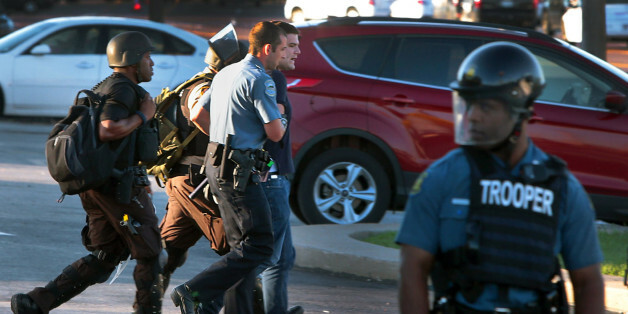 Huffington Post reporter Ryan Reilly and Washington Post reporter Wesley Lowery were arrested Wednesday in Ferguson, Missouri, where they were reporting on the protests that have erupted following the death of Michael Brown, an unarmed African-American teenager who was shot by a police officer last week. We are relieved Ryan Reilly and Wesley Lowery are safe, but we are disturbed by their arrest and assault. Ryan was working on his laptop in a McDonald's near the protests in Ferguson, MO, when police barged in, armed with high-powered weapons, and began clearing the restaurant. Ryan photographed the intrusion, and police demanded his ID in response. Ryan, as is his right, declined to provide it. He proceeded to pack up his belongings, but was subsequently arrested for not packing up fast enough. Both Ryan and Wesley were assaulted. Compared to some others who have come into contact with the police department, they came out relatively unscathed, but that in no way excuses the false arrest or the militant aggression toward these journalists. Ryan, who has reported multiple times from Guantanamo Bay, said that the police resembled soldiers more than officers, and treated those inside the McDonald's as "enemy combatants." Police militarization has been among the most consequential and unnoticed developments of our time, and it is now beginning to affect press freedom.